Like their civilian counterparts, Correctional Specialists in the Marines are responsible for supervising prisoners (or as the military prefers to call them "confined and restrained personnel"). They work at Naval brigs and correctional custody units and are tasked primarily with keeping the peace and preventing escapes. It is a primary military occupational specialty (PMOS) in the Marines and is open from the Master Gunnery Sergeant rank all the way down through Private. It's categorized as MOS 5831. In addition to guarding and supervising confined personnel, these Marines perform routine inspections, process personnel for confinement and release, and transport prisoners, absentees, and deserters. They manage prisoners' funds and personal property, monitor prisoners for behavior changes and report any infractions of Marine Corps regulations. Corrections specialists also provide expertise to commanding officers on the safe, humane and efficient care of enemy detainees entrusted to their care. 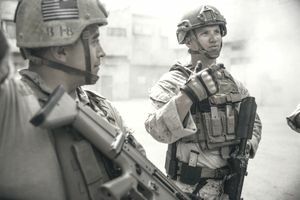 The majority of these Marines serve in a garrison environment, but a small number act as advisers, kind of force multipliers who train and provide insight on techniques for handling these enemy detainees. Although it may seem from the title that these Marines are unlikely to see much combat action, in fact, they may be crucial when dealing with enemy combatants. For instance, during Operation Iraqi Freedom in 2004, corrections specialists were deployed to support detainee operations, to ensure humane treatment of prisoners under the Geneva Convention rules. In short, in any combat situation where an enemy is captured or surrenders, a corrections specialist is needed to make sure the detention process goes as smoothly as possible. Enemy prisoners may hold strategic value; many hold intelligence that could prove useful to Marine commanders. When there's a shortage or potential shortage of corrections specialists in a combat situation, the trained MOS 5831 provides training and supervision to other Marines who may assist with transporting enemy detainees across hostile territory, for instance. To qualify for this job, you'll need a score of at least 100 on the General Technical (GT) section of the Armed Services Vocational Aptitude Battery (ASVAB) tests. After completing boot camp either at Parris Island in South Carolina or the Recruit Training Depot in San Diego (depending on where you enlist), you'll be required to complete the correctional specialist course at Lackland Air Force Base in Texas. To be eligible to serve as a Marine correctional specialist, you need to have a record free of convictions by courts-martial, You must not have any nonjudicial punishment convictions involving drugs or "moral turpitude," and no record of civil court conviction which resulted in confinement. Due to the nature of this job, there are many aspects which have no civilian equivalent. However, you'll be qualified to work as a corrections officer at a civilian detention center or jail and could also work as a security officer. The skills you'll learn could help pave the way to a career in civilian law enforcement, but additional training and certification would be required. MOS 0203 Primary Platoon Commander Duties in the U.S. Marine Corps.